How to Pay For Plastic Surgery With Bad Credit? Hello, everyone. Plastic surgery is something that I’ve never thought about before. I’m okay with my looks, and it’s expensive. Sometimes people have accidents, or they want to change their appearance up (The Kardashians). Plastic surgery is a permanent way to get that done. Everyone who wants to get plastic surgery may not have the nest credit. You may be wondering how you can pay for plastic surgery if your credit is bad. There are some ways out there that can help you save money. One major way that you may be able to pay for plastic surgery is with unsecured financing. It’s not easy to get, though. If your credit is bad, the lenders will be less willing to approve an application. If your application is approved, the interest will be very high. Is that something that you want to have to worry about paying back? If so, there are two types of unsecured financing. Payment plans are for patients that have bad credit history. They are typically set up by the hospital or doctor’s office where the surgery will be taking place. With payment plans, you will have a working relationship with the provider group. The provider will provide you with all the details of the payment plan such as the due date and the amount. The other type of unsecured financing is to apply for an online unsecured loan. With those type of loans, the lender does not need to know why you are borrowing the money. If you are approved for the loan, the money will go directly to your bank. That will give you the freedom to work with whatever plastic surgeon that you choose to. If you choose the unsecured finance option, make sure that you check the interest rates. They are usually higher especially if your credit is bad. Another option is to use a Flexible Spending Account to pay for your plastic surgery. An FSA is an account that you can set up with your job. You put cash into it that you can use to pay for certain out of pocket health expenses. This money is not taxed. Anyone can set up an FSA with their place of employment. You just have to set it up to deposit enough money into the account once you get paid. If you use your FSA for plastic surgery, you won’t need a credit check. Your employer won’t pull your credit. As I stated earlier, any employee can sign up for one. Your FSA also allows for plastic surgery financing at 0% interest rate. You will have to repay the loan with your pretax payroll deductions. That’s good because you won’t have to pay anything extra. As you can see, there are some options for you to pay for plastic surgery if you have bad credit. Review the options and figure out which one works the best for you. 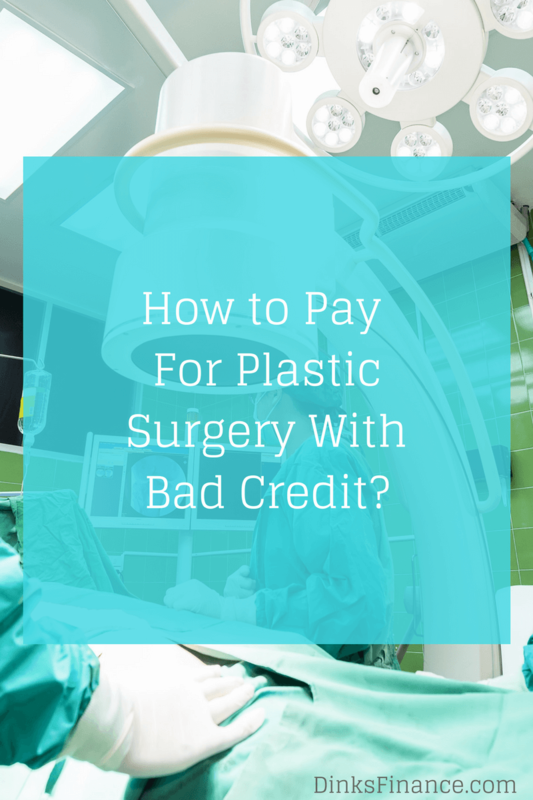 Would you consider getting plastic surgery if you had bad credit? Oh gosh, I would say the best way to pay for plastic surgery with bad credit is to … not get plastic surgery. If it’s medically necessary, insurance will often cover it (ie. nose jobs for breathing problems or dangerous moles). If it’s solely for the purpose of vanity, I would say financing is a terrible idea, even if you’re debt-free. There’s something icky to me about not even owning your own body. My vote is to do whatever the hell you want with your body, but pay for it in cash. Previous post: Do You Tip House Painters? Next post: Do Food Stamps Roll Over?